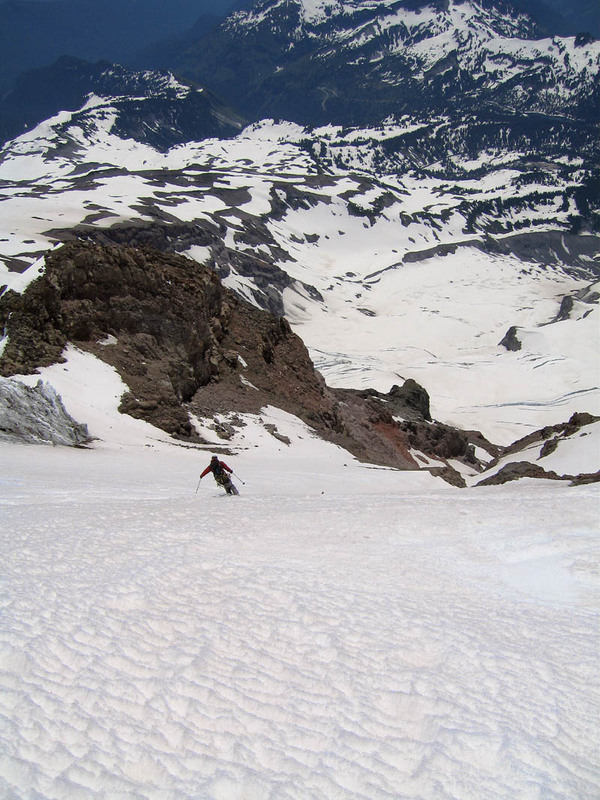 Michael had been talking about doing this route on Rainier for several years. 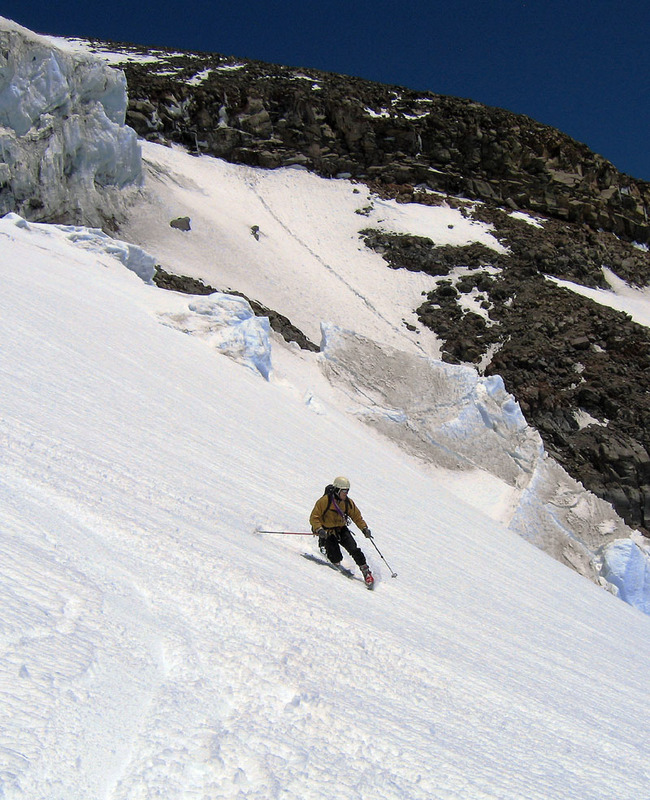 The Fuhrer Finger is one of the less well-known routes on the mountain that happens to have some incredible skiing. 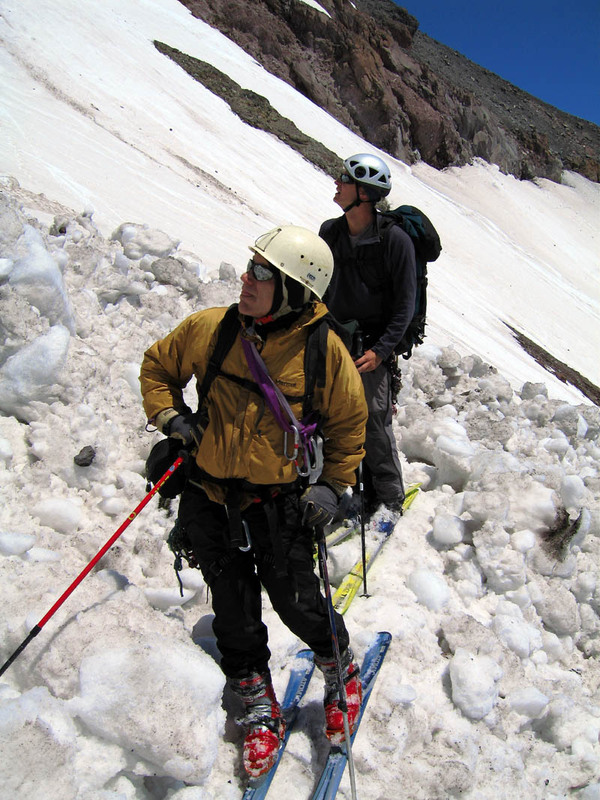 After reading accounts of Sky, Adam from ProSki and others who had skied the Finger recently, and getting some information from Paul Belitz, Michael and I were keen to ski it this year before it melted out. 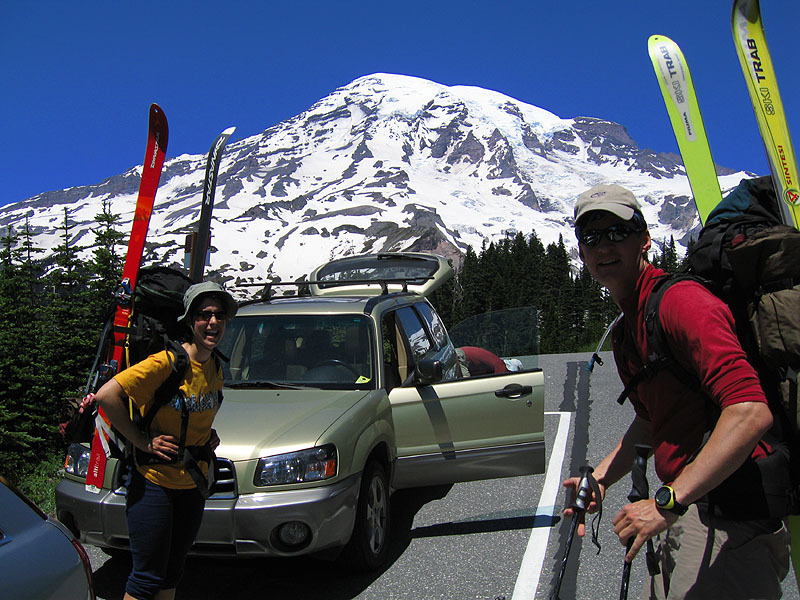 The weather window looked good for the first weekend in July, but we were concerned about getting climbing reservations for one of the busiest times of the year at MRNP, so I juggled my work schedule so we could leave Friday rather than Saturday. At the last minute, Paul Russell decided to join us, so we hooked up at the IKEA Plaza Burger King late Friday morning before bombing the 167 out of town. We called and found that no one else was booked for the Fuhrer Finger on Friday, so no hurry - we took it easy and enjoyed the drive in perfect summer weather. None of us had been at Paradise for a few weeks, and we suspected there might be a bit of a hike before we could start skinning, but lo and behold, about 50 feet from the trailhead out of the visitor center we found continuous white stuff. To the amusement of the tourists playing in the snow, we applied skins and started up, paralleling the walking path up to Glacier Vista. It was roasting hot; we were in shorts and t-shirts and still sweating buckets. From Glacier Vista we descended on skins and roped up to cross the Nisqually Glacier, which was still in good shape and well filled in - quite a change from last year! 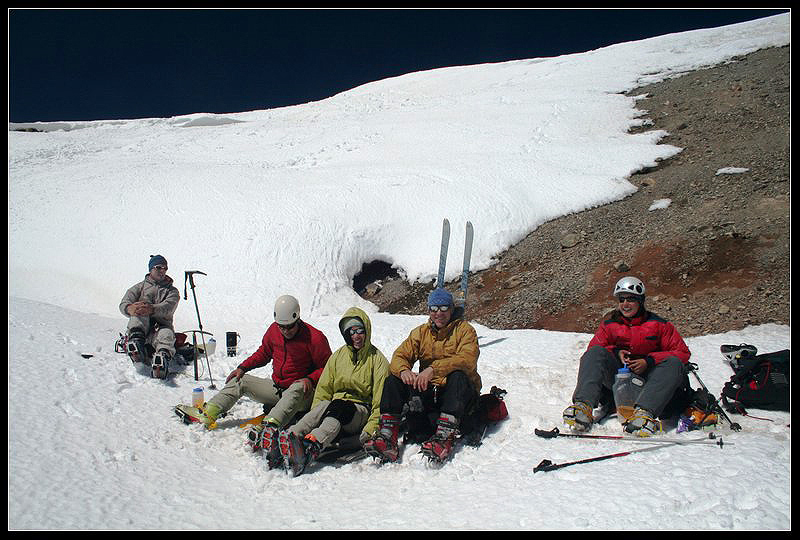 We headed up to the high camp described in Mike Gauthier's book at 9,200 ft. and kicked back, enjoying a great meal of couscous prepared by Corinne in a cool series of wind-protected bivy sites that looked like something the Incas might have built. We watched a glorious sunset with views to the south of Adams, St. Helens, and Hood and then got in our bivies as the air began to chill. Figuring in the high freezing level and projected time needed to get up and down through the Fuhrer Finger with minimum exposure to rock fall (meaning skiing around 10:00 AM), we agreed to wake up around 2:15 AM and leave camp around 3:15. 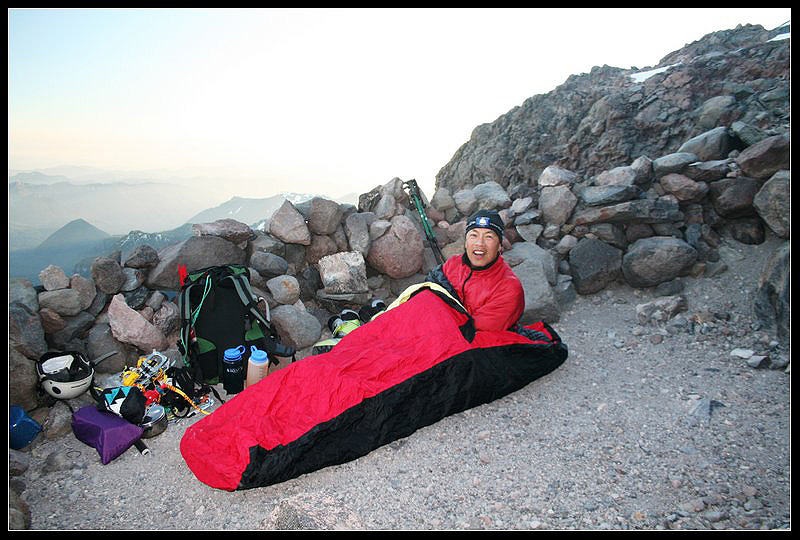 Everyone seemed to nod off pretty quickly once in their sleeping bags and slept soundly until around 11:15, when clanking and headlamps woke us up. Surprise! Monika and Oyvind, both of whom had e-mailed me about "possibly" joining us on the route but who had needed to work on Friday, had in fact mobilized to leave town and had started up from Paradise a little before 8:00. 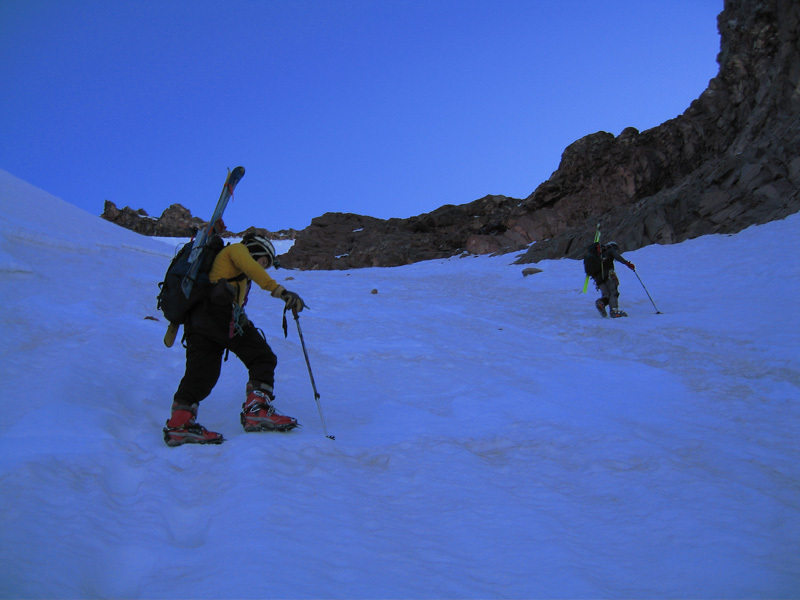 With the long daylight hours they had been able to follow our tracks across the Nisqually and were eager to ski the Finger the next morning. I woke up right on schedule at 2:12 without my alarm. 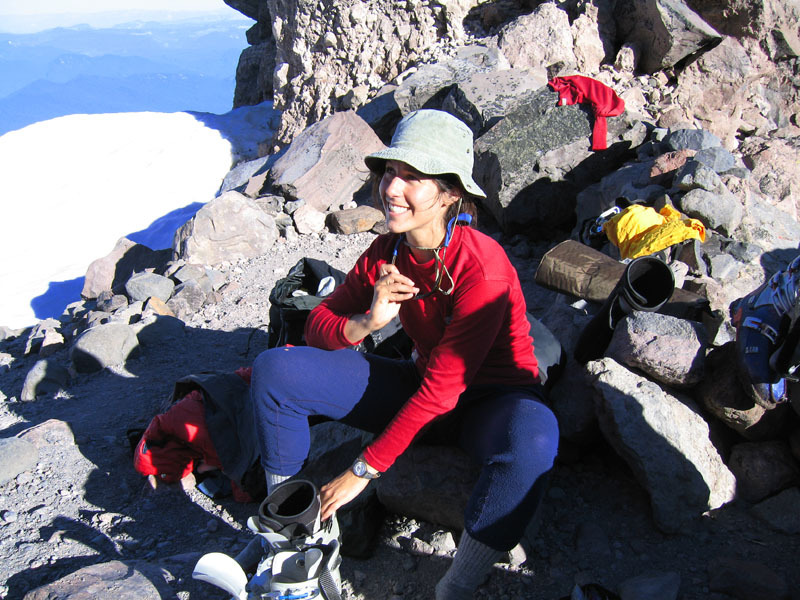 A little chocolate, a Clif Bar and some tea. Helmets for sure on this route. We set out about 3:25 and soon realized that most of our headlamps were inadequate for navigating a glacier in the dead of night - fortunately Corinne had won a new Petzl MYO lamp at this year's randonnée rally and it saved the day (or night), being easily twice as bright as everyone else's. We made our way over to the base of the Fuhrer Finger traversing on snow that was firm but not icy, perfect for crampons. The Finger itself was heavily runnelled and littered with rocks of varying sizes, but not a problem for ascending. The plan, of course, was to climb the top part where we went far climber's left under a sketchy looking cliff of loose rock and dirt at the coldest part of the night and it worked out. Above this section we worked our way climber's right through a broken section of the upper Nisqually, but the route was well marked by climber's and skier's tracks and we felt good traveling unroped. As we made our way onto the main open part of the upper Nisqually the route was well marked with wands. 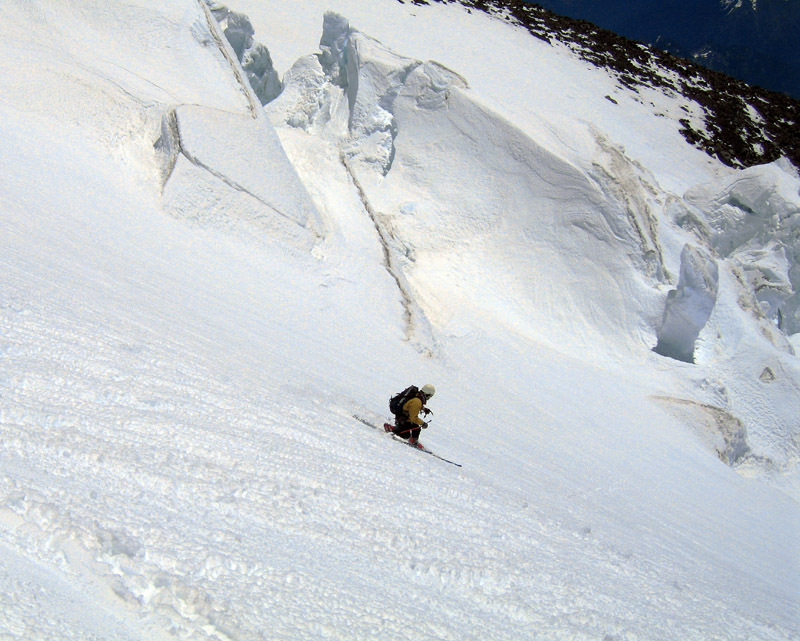 Good thing, as there were several critical crevasse end runs that weren't immediately apparent from below. 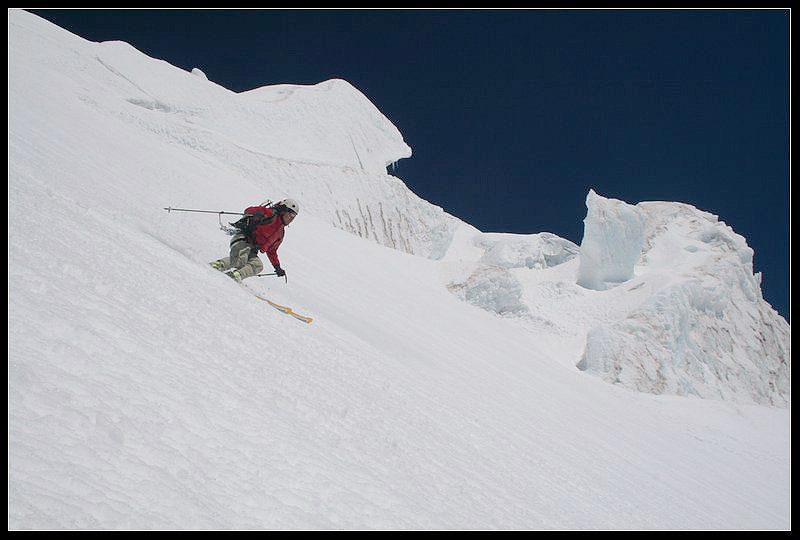 The scenery was spectacular on the route, with immense crevasses and seracs along the western side of the glacier that we had never seen from this angle. The climbing went extremely well, as everyone felt good and we adopted the medium-paced and steady philosophy. Above 12,400 I started to feel the need to slow down, but concentrated on breathing and a slightly slower cadence and we continued to make good progress - no headache at all, fortunately, and the perfect weather with just a slight breeze was a gift. 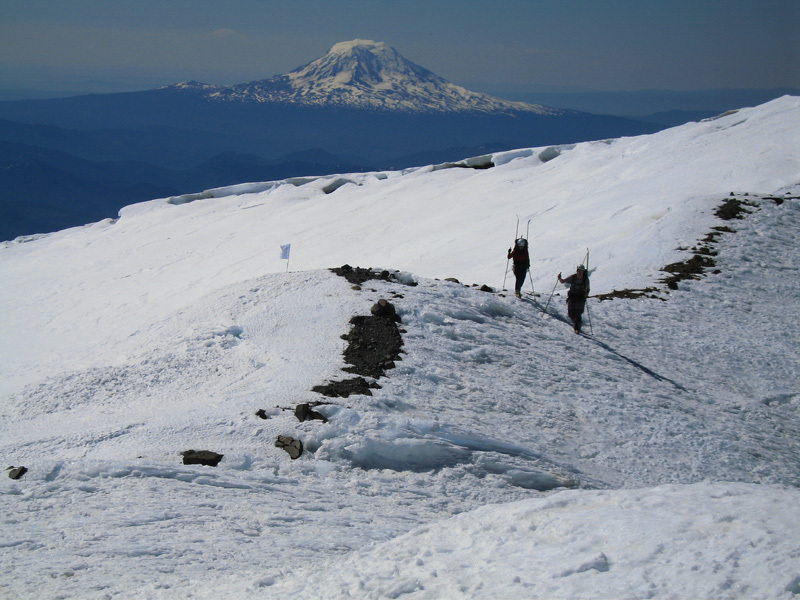 We summited a few minutes after 10:00 AM in perfect conditions; everyone in our party commented that it was the nicest weather they had ever seen on the top of Rainier. We saw a couple of guys who had just reached the top and were talking about how the route was "hairball" - when I asked them how they had come up, they said the Willis Wall! Yikes. The breeze was refreshing on top, but we decided to descend into the crater after a bit to eat and relax, as well as wait for the snow to soften a little for the descent. Bread, salami, chocolate and Gatorade, followed by a little snooze - we would have stayed longer but were worried about the potential for rock fall in the Finger, so we hiked back over to the top of the Nisqually and put on the skis. The top 800 feet or so were heinous frozen sastrugi and bumps and barely skiable. For a few hundred feet below this, we encountered still frozen corn that allowed actual turns, and then . . . when we got below the stuff that had been hammered by the wind . 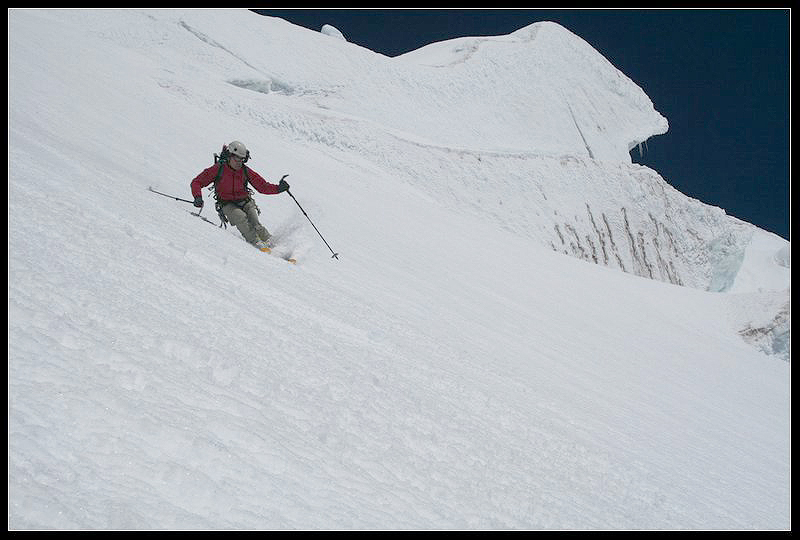 . . about 3,000 vertical feet of perfectly softened corn on the upper Nisqually. 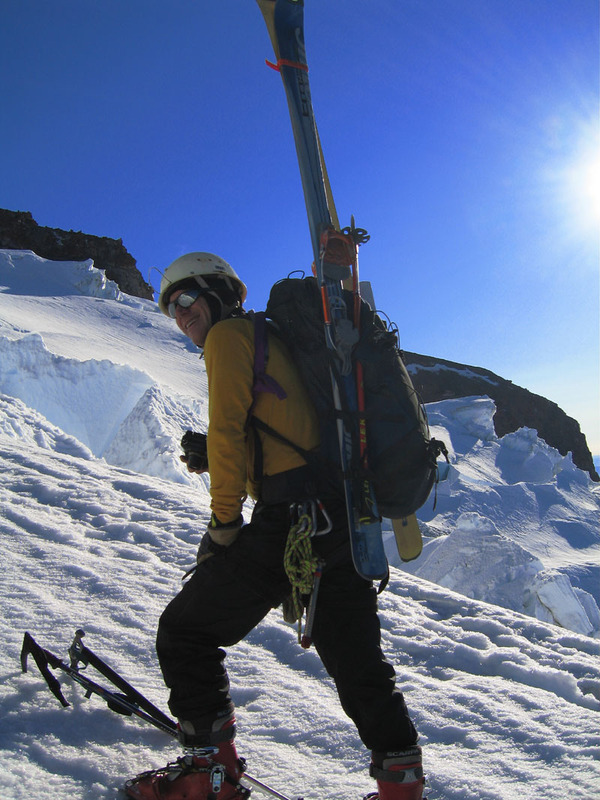 Much better than we had been expecting, with a perfect angle for relaxed skiing, you just had to keep an eye out for the wands that signaled a direction change or critical crevasse end run. Entering the traverse over the Fuhrer Finger, we carefully followed our uptracks and crossed a couple of snow bridges before coming to the sketchy part under the dirt and rock cliff - this section will probably become unskiable in a few days time if the hot weather continues as it is already heavily lined with rocks and there is only a narrow section of snow that needs to be sideslipped or skied with very short, controlled turns. 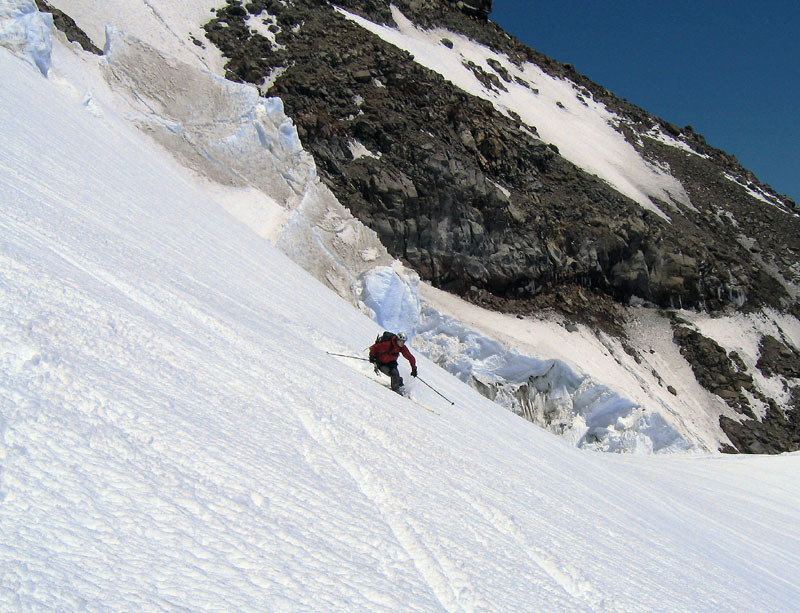 We skied one at a time through this part, with a spotter to yell "rock" if anything came loose. As we entered the Fuhrer Finger proper, the snow conditions deteriorated to corn mush with plenty of rock obstacles to make the skiing interesting. It was a fun ski, not as steep as legend would have it, and no problem at all given decent snow conditions. As we exited out the bottom and looked toward the traverse to our camp, we were surprised to see the debris from a huge serac fall covering our tracks from earlier in the day - apparently it had fallen in the past couple of hours. Good thing we took our time at the top before the skiing! 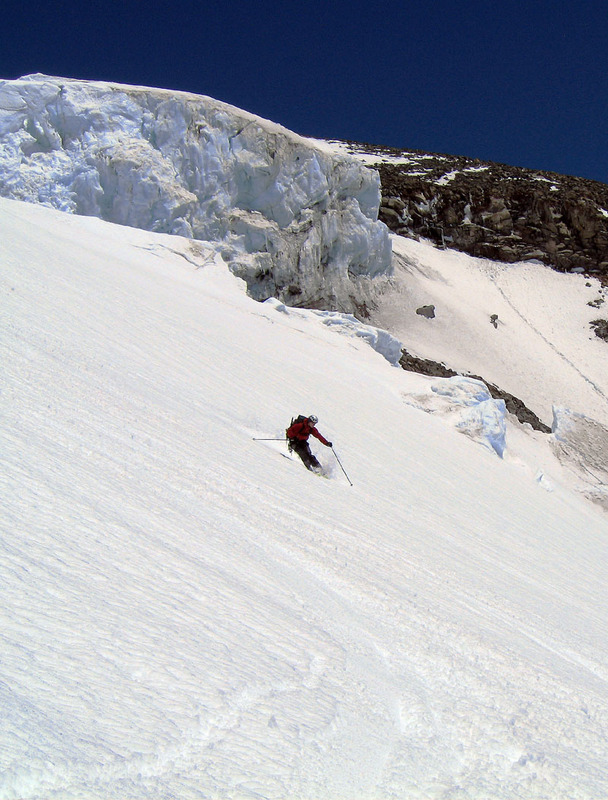 We were able to cross the debris on skis, thereby saving a significant amount of extra descending (and climbing WITHOUT skins!) and made it back to the campsite without any climbing. We repacked our gear at camp, dumped some clothing as the temperatures were in the high 70's, and headed back across the lower Nisqually to Glacier Vista. The upward slog to the ridge was a downer, but skiing back to Paradise with myriad tourists taking pictures of the crazy skiers was fun as usual. The people in line behind us to buy cheeseburgers at the Visitor Center were incredulous that we had just skied from the top of the mountain, and were dead serious when they told us that "there's nuthin' lahk this at all in Oklahoma."